If you have a hygiene-critical space, the Bauer Aseptic Drive is a great solution. It is designed with hygiene in mind, having a smooth surface that allows for easy run off when cleaning, with no pockets that allow for dirt and dust to accumulate. 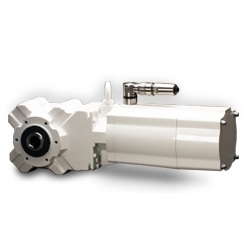 This versatile motor can be fitted onto any gear in our BG, BF, BK or BS line. High degree of protection (IP 67 and IP69K) as standard, with Aseptic acid and alkali resistant paint (pH2 - pH12). Motor windings equipped as standard with thermistors and class F insulation. Suitable for frequency inverter duty.